Pennsylvania historical fiction and biographies are always discounted at Schoolhouse Publishing! All of the books listed in this section are set in historic Pennsylvania. 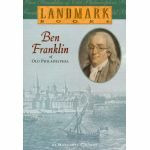 If you would like your homeschool student to read some great literature that will fulfill his Pennsylvania history requirement while at the same time serving as a springboard for his United States (American) history requirement, then take time to browse through our great selection of Pennsylvania History literature...at incredible prices!